Material design language for the user interface for Android debuted way back in 2014 on Android 5.0 lollipop. However, the same design language is being used to date on Android 8.0 oreo, albeit a bit more refined to keep it relatively fresh and modern. Material design is based on paper and ink. Designer Matias Duarte detailed that “Unlike real paper, our digital material can expand and reform intelligently. Material has physical surfaces and edges. Seams and shadows provide meaning about what you can touch”. Speaking of Material Design, let me come to the main topic of this article. 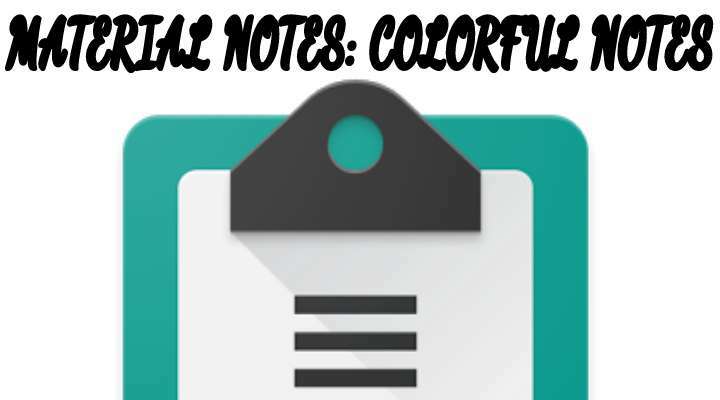 Today, I would like to take a look at an called Material Notes: Colorful Notes. 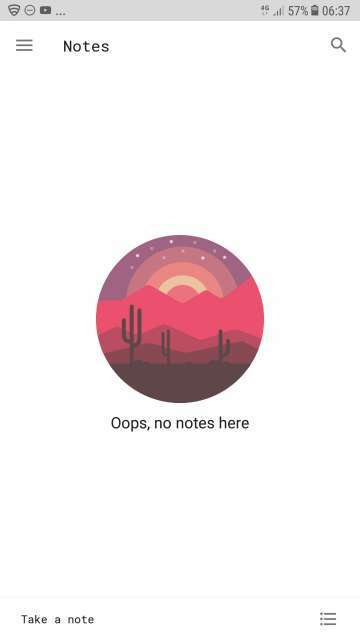 This app is pretty much the same as any other note-taking app, but with a more colorful, vivid, and vibrant approach to notes in terms of its look and feel. Hence, inspired by the Android Material design language. 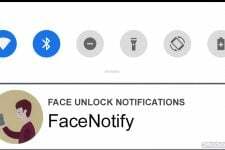 Moreover, the app also provides you with the ability to lock every single note you have jotted or taken down with a 4 digit PIN. Enough said, let’s dive straight into the screenshots to take an in-depth look at Material Notes: Colorful Notes below. Welcome to Material Notes: Colorful Notes. 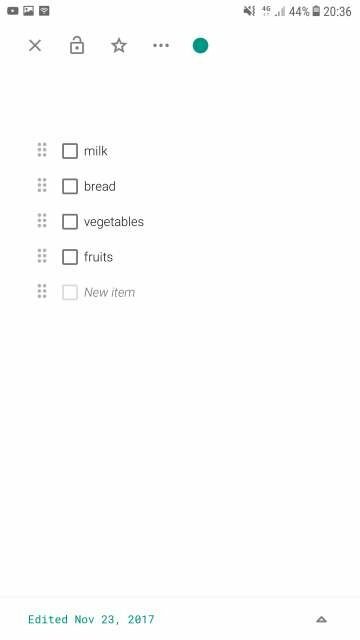 Tap ‘Take a Note’ to start jotting down notes or tap the three-line button to create a list of items that are required when planning to shop in a grocery store. 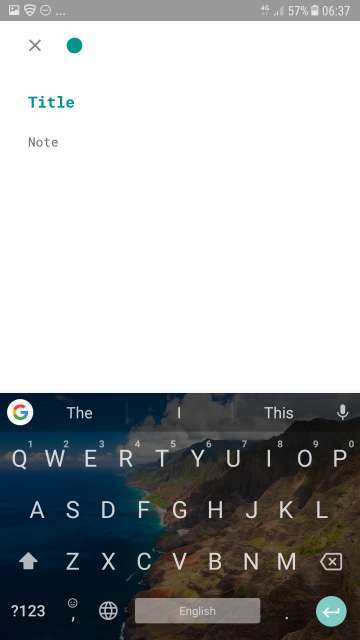 Tap on ‘Note’ to take down important notes and reminders. Moreover, you could also provide a title for the note you would be noting down. Furthermore, you could also change the color of the notes. Refer the next few screenshots carefully. Create a list of items that you would like to buy from a grocery store. Jotting down a note in action. 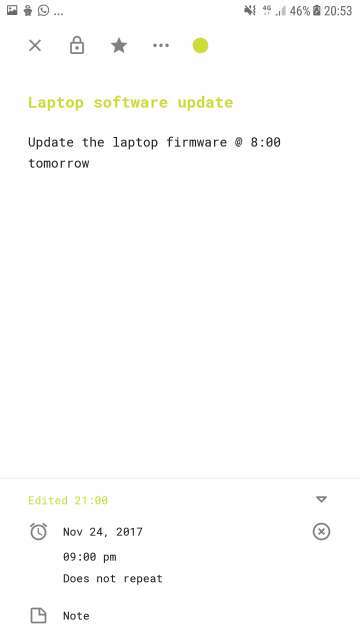 Tap the UP arrow located on the bottom-right hand side to access options regarding setting a reminder for any specific date or time and repeat option. 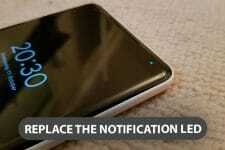 Reminders will appear in the notifications panel at a set date and time. Refer the first notification in the screenshot below. 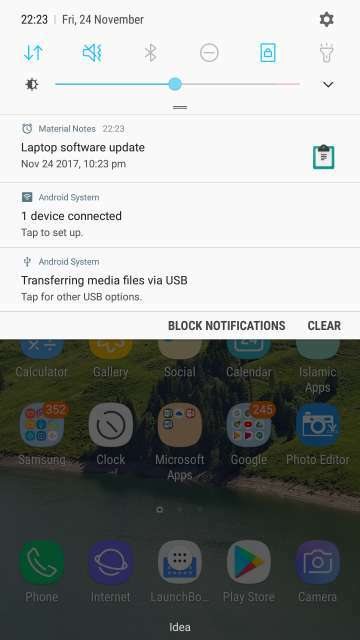 Reminders appear in the notifications panel at a set date and time. Material Notes showing all of my created notes and a list on the main screen. Notice the note colored in light green (third item) has its contents hidden. The note is secured by a PIN number. Night Mode in action. 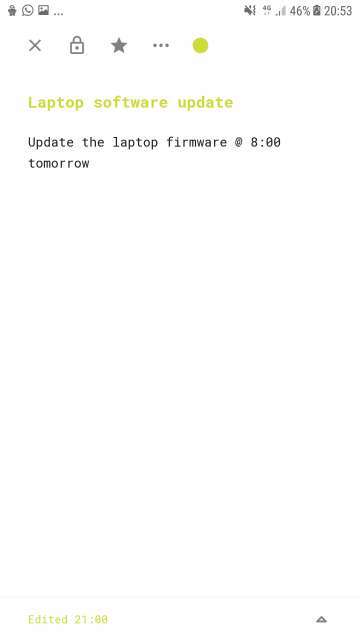 to enable night mode, go to any note or list, tap the three dot button and tap Night mode. 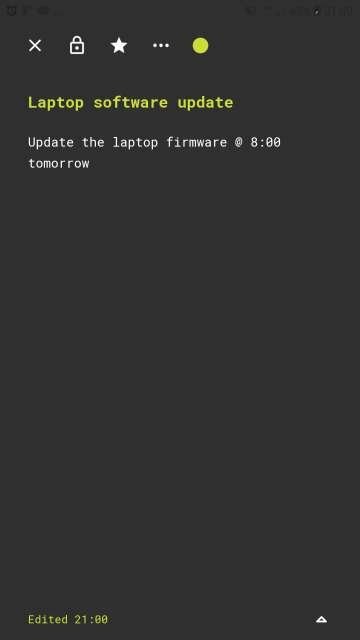 Similarly, follow the same step to disable night mode and enable day mode. 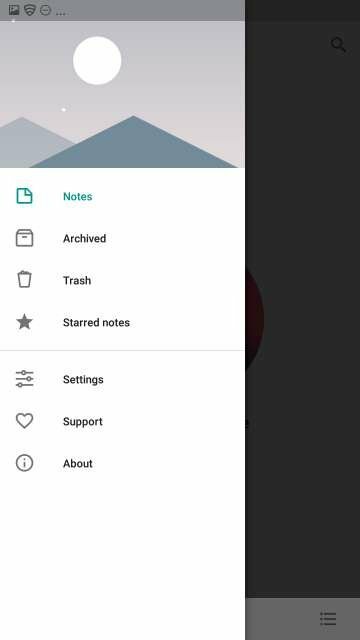 Tap the Hamburger menu button located at the top-left corner of the screen to be able to access archived, trashed, and starred notes. Settings. Here you can assign a PIN to provide you with the ability to lock a note or a list. Other available settings are self-explanatory. 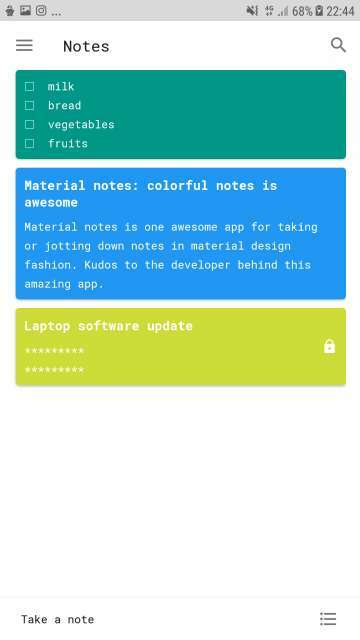 And there you go Droidviewers and tech enthusiasts on an in-depth look at Material Notes: Colorful Notes app for Android. This is a very useful and beneficial note taking app that I would highly recommend to all you readers out there. Kudos to the developer cw fei for such an amazing and thoughtfully designed app. I thoroughly enjoyed using this app. Just three words: Beautiful, Clean, Functional. Feel free to chime in the comments below on your take and experience with this neat little app. 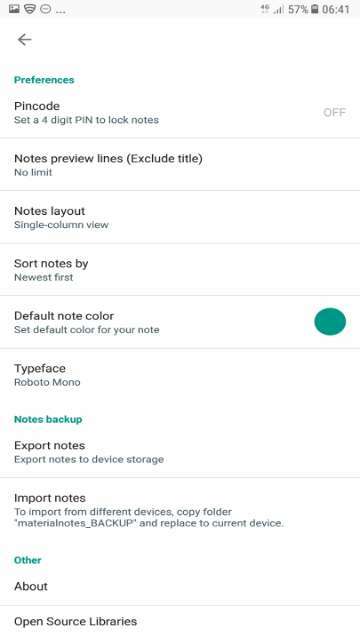 Download Material Notes: Colorful Notes via the Google Play Store link given below.